As long as man has created artefacts he has also decorated them. It seems as if the need to add individuality, design and/or texture to objects is as great as the desire or need to create tools and objects in the first instance. From bronze age raised designs and glazes on ceramic-ware to the decoration of knife hafts and blades and arrow heads etc, man has sought to add visual interest to what are functional objects. Living space has always been decorated in some way. Since Cro-Magnon times humans have painted and marked the walls of their homes. 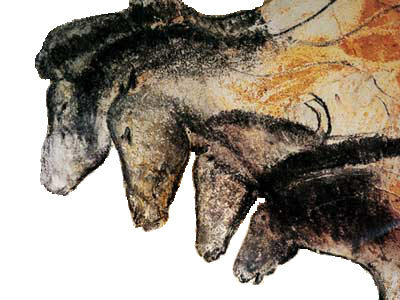 The discovery of the Chauvet-Pont-d’Arc Cave in the Ardèche department of France containing the earliest known cave decoration dating from 32,000 – 30,000 years ago point to mural painting having a longer history than any other kind of painting. As painting became more popular boards of wood were used as the base until the arrival of the Renaissance period (approx. 1400-1700). During this period, with the expansion of trade and merchant shipping painting on canvas became popular. Originally sail cloth would be used. Interestingly origin of the word “canvas” is in the word “cannabis” as early sail was made from hemp. Canvas was probably used for the first time in or around Venice by portrait artists. The use of canvas was a revolutionary step for painters, no longer were they constrained by the type or size of wooden board that they could source. Canvas also had the advantage of being light, durable, cheap and sizeable. In this example on the right a lavish abalone shell inlay decoration has been applied to a guitar fret-board. Example of “Art Nouveau” decoration applied to a brooch by René Lalique. (This picture is used without permission of Dan Johnston whom I did try to contact to ask permission. The software wasn’t adequate to allow it. I have linked to his albums in the mean time.) Decoration has become an inbuilt feature of design. So much so that many never see the hundreds of examples around them daily. Company logos, branding marks, tattoos – decoration is literally nearly omnipresent.